The conflict in Syria is often considered WFP’s most complex emergency. Constantly changing conditions on the ground require the humanitarian agency to be ready to seize every opportunity to reach the most vulnerable. Nowhere is this difficult reality more clear than WFP’s ongoing efforts to reach Syrians trapped inside besieged areas without access to food. There once were 18 besieged areas under opposition control where government forces used hunger as a weapon of war. As that number has dwindled, the intensified fighting in holdouts like Eastern Ghouta in the suburbs of Damascus has made it almost impossible to reach the nearly 400,000 people in need there. People are living underground in basements. Families are skipping meals and some children are eating animal fodder to survive. Medicine is nowhere to be found. For the first time in months, last week a WFP truck convoy arrived in Eastern Ghouta with enough food for 7,200 people. But aerial bombardments have prevented WFP from sending additional convoys to feed everyone living in more than 10 cities in the area as calls continue for a cessation of hostilities. Fluid conditions in Syria require WFP to adopt different strategies to reach more than 3 million people every month with lifesaving assistance. Truck convoys require at least 48 hours of calm to safely deliver aid, and cross-border deliveries from Jordan and Lebanon help fuel WFP’s operations. 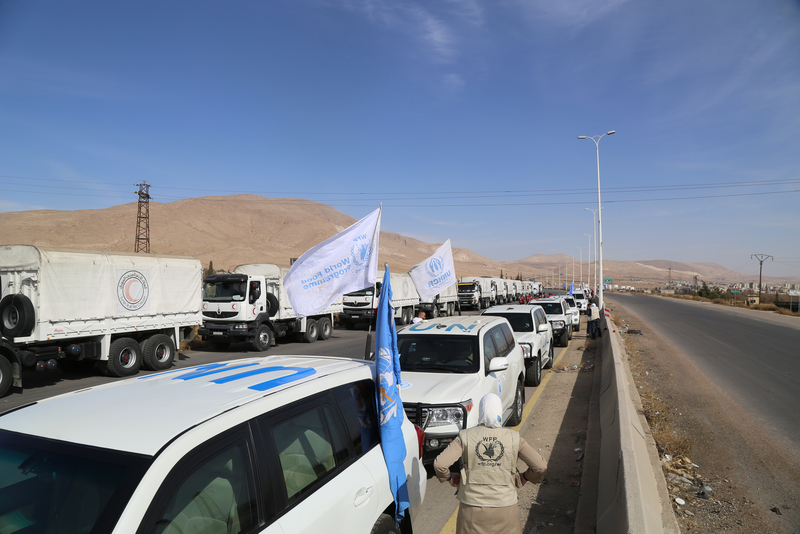 When delivering food within Syria, WFP must acquire facilitation letters to more easily cross checkpoints from its warehouse in Damascus to areas of need. In northeast Syria, WFP has regained access to parts of the region that were previously reachable only via high-altitude airdrop. The humanitarian agency regained access to the once-besieged city of Deir Ezzor after ISIS militants were pushed out late last year. This development allowed WFP to efficiently send truck convoys with food to reach more than 100,000 people who still live in the area, instead of high-altitude airdrops that can be riskier. Nearing the start of its eighth year, the Syria conflict has left millions impoverished and hungry. Some 6.5 million people in Syria are now food-insecure, which means they lack reliable access to a sufficient quantity of affordable, nutritious food. At the same time, 4 million people are at risk of becoming so—twice as many as a year ago. Unemployment is up to 55 percent, with peaks of 78 percent among young people. In January, WFP provided food assistance to 3 million people, down from 4 million in August due to significant funding constraints. In calmer areas of the country, WFP is increasing its support for long-term recovery by focusing on livelihoods, nutrition and improving access to primary education through school meals and food vouchers. WFP needs your help to ensure that the people of Syria have the food they need to survive. With your support, we won’t turn away from the men, women, and children who desperately need our help.